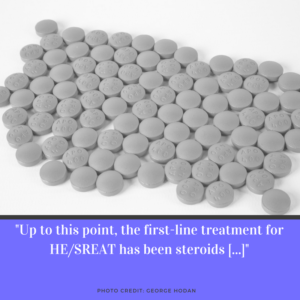 Up to this point, the first-line treatment for HE has been high dose steroids because most, although not all, HE patients respond to steroid treatment. (1 g/day) for 3–7 days. Symptoms sometimes begin to alleviate within as little as 1-2 days, although improvement is more commonly seen on or after day 3-4. Patients receiving such treatment often return home on an oral dose of 60 mg/day prednisone, which is slowly tapered down over six to twelve months. and in fact some HE/SREAT patients respond well to one treatment protocol but get no relief from another.